Welcome to the world of racing, where every millisecond counts. Driving a car is more than just giving any gas and brake. When racing, it's about getting the most out of the machine and with the utmost concentration to find the shortest path across the track. In this guide to Gran Turismo 6 we want to carry everything that is needed for it. From basic techniques and rules of thumb when driving up to the most important tuning tips. If you engage intensively with the matter, you can soon finish the toughest competitions in top positions. This is true not only for Gran Turismo, but also for other sim-oriented racing games. This includes the previous Gran Turismo 5 as well as the competitor Forza Motorsport. Despite all the advice we give you here, you will need a lot of practice to master all the driving techniques. Take our control tips to heart, because the absolute, sensitive control of your vehicle is the alpha and omega for fast lap times. Beginners and casual racers should do primarily with a familiarization with the controller inputs familiar - or possibly flirting with the purchase of a steering wheel. A steering wheel is not necessarily required, but can improve the control of the vehicle. Many players see an analog control now take for granted. Analog sticks and equally sensitive buttons for gas and brake, there is not just since yesterday. However, some anomalies are observed, because a lot of the players do not take advantage of the analog control. Meaning: Many control as if they were using a digital control pad and pull the stick permanently to the far right or far left. 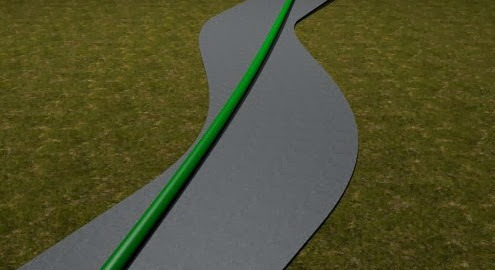 This has the consequence that the course must be corrected later mostly because it is rare to find the correct angle for a curve with such coarse inputs. Depending on the turning circle of the car used is sufficient tucking in about 25% to 50% of the maximum strike, if one retains the control direction constant. It is absolutely unnecessary and not at all conducive repeatedly rude to tap in one direction. Instead, one should maintain a constant steering angle. Why this is so, learn it in the chapter "How to brake properly". Accustom to you, to move for easy steering maneuver the analog stick just a little to the left or right. This requires sensitivity, but helps immensely, as you will have less readjust. Seek out a training run and a slow car out to train this ride and to get a feel for the correct steering angle in a curve. The same goes for gas and brake. The rear shoulder buttons L2 and R2 can press sensitively to the rear. So you can, for example, maintain a certain speed constant or use sensitive braking techniques. You use for gas and brake, the so-called "tram-control" on the right analog stick, so the same applies. You do not ever give full pot gas or lie down mad hard braking. Sensitivity and constant commands are the key to success. Observed when the tram control that you can only enter or apply the brakes. Usually you will not need both at the same time, since no cartoon characters as something donut-turns are on the agenda. Who drifts like will notice, however, that the path between gas and brake is too large for this control variant and requires too much time. Thus you are even more in need of radical handbrake. Rule of thumb 1: Who directs the brakes, time has given away. During a braking maneuver block your tires. Although you can give in minimal but the price correction is so small that you can save yourself the effort in most cases. Although anti-lock braking systems (ABS) prevent your wheels from locking up, but also reduce the braking effect. ABS is intended only as an emergency solution in normal traffic, so you can avoid an obstacle if necessary. On the racetrack, ABS has no advantage. It simplifies the handling but also cost you a lot of time and prevent you from drifting. Waive this driving aid, if you want to achieve personal best. Rule of thumb 2: Ahead of the Curve brake, accelerate out of the curve. Since direct senseless during a brake pad, you have to get used to brake early, to keep before the apex of the curve the best possible speed and accelerate out of the curve. The best possible speed at a curve is dependent on the angle and the vehicle. They should individually out fumble for every vehicle. To do this you need to remember, but usually no exact speed values - it is enough to remember which gear you use the corresponding curve. In order to lose as little time and be able to draw again as early as possible, you should also pay attention to your braking style. With hard curves you should slow. The advantage of the declining balance brakes is the increased control before give in. The longer you slow down, the slower the car is. With decreasing speed you need less braking force. That you should take advantage because hard braking reduce the speed often much too strong, so that you too slow coming into the turn. When degressive brakes you can better judge when you can step on the gas again and also have better access to the tires. Progressive braking is the opposite way. In this technique, you brake at the beginning only very slightly and push the pedal or the button on the controller with the time getting stronger. This technique you rarely need on a race track, because you usually progressively slow down only if you want to come to a complete stop at the end. However, sensitive slow the overall speed in lighter curves be useful. Remember: you do not necessarily have the brake knob fully push through. In gentle curves, it is often sufficient to easily slow down and briefly minimally harder to throttle if you have underestimated the curve. In both cases, the primary goal of achieving a liquid as possible drain - so come without unnecessary stops and journeys through the turn. As already mentioned, you lose while pressing the brake, the control of your wheels. But giving-even cost your speed. Therefore, there are two approaches to a curve, which can be roughly categorized as. If the range is wide, then try to be as far as it goes straight to drive. So does that mean, you direct so sensitive as possible and draws the curve out as much as possible. Thus you can when retracting properly accelerate and wins already on the curve at speed. Bear in mind that the centrifugal force carries your car to the outside. The faster you are, the more curve radius is required. For wide sections you have the advantage of being able to use the existing surface. In narrow curves you have no place to extend your car with a constant speed. Therefore, you must think exactly the opposite in such curves. The aim is to get as quickly as possible in a position to drive in their straight and thus better acceleration can. Look at this diagram. Critical is the vertex between curve impact and possible top speed in the curve. This is the point from which the influence of the tire is lowest on your speed. After this point have small corrections to the course as well as no effect on your acceleration. The trick of the matter is, to find the correct point for acceleration. Speeds her too early, you will be taken from the graph, it accelerates too late, you reach the apex late and crossing the line more slowly than it would be possible. Bear in mind that you will progressively faster when accelerating. This means, conversely, that you still have a moment when you press the accelerator pedal, turn things around control without the centrifugal force is too strong. Try anyway, the worst steering movements to accomplish if you hold the speed or rolls freely, to give or to brake without gas. Now it comes to the crunch. Hairpins are the toughest curves, which you will encounter. But again, you should not follow the road, but look for the shortest path with the highest possible speed. This results in two approaches. In the steep variations of a hairpin, you have to brake heavily before you enter the curve. Similar to the curves on narrow streets you will have the period in which it steers hard, as short as possible. If you find a reasonable but constant speed, you have the worst behind you, if you pass the apex of the curve. In contrast to the previous example, the apex between the impact speed and the curve is exactly the same with the geometrical apex of the curve. Say: At the steepest point, you're the slowest, but provide braking under any circumstances. Let the fingers and the feet of all the pedals and rolls over the vertex. Give only the gas again, if you reasonably straight ride and not risk re-runs to be removed from the centrifugal force. Pay attention also in hairpin bends on the course of the next curve. Usually you have to approach from the outside. Follow the next curve in the same direction as the hairpin, then you can make relatively early steam and cause you to wear out. At opposite corners you should have to brake as little as possible, because "Stop and Go" cost you more time than usually a constant speed. In the soft variant almost the same rules apply as for the hard hairpin. However, the time in which it is coasting at a constant speed is much longer. Accelerating out can you very late, but since you easily loses speed when rolling, you should give a short push or use your analog input sent if required. Hold the button the pedal around 50%, so that the car is traveling uniformly. If two curves with different directions in quick succession, it is called this section of an S-curve. Although it's about two curves, should you make the tackle as a maneuver. The goal is to find the straightest path through both sections, in which you steer a little and you have the best brakes even less. In our simple example, the S-curve is so soft that you can almost pass straight through without having to get off the throttle. We need only to find a favorable angle. Pressing on the tube, however, you should avoid violent corrections, because the end in most cases unintentional spin. Even if you sent against controls you will cost too much time. If both parts of the curve steep, it is more difficult. In that case you should just accept as possible and decelerate gently before the first corner. In these cases, the harder you can not avoid a detour. As usual it takes a steering maneuver is most effective when it rolls out there - so give neither gas nor brakes. 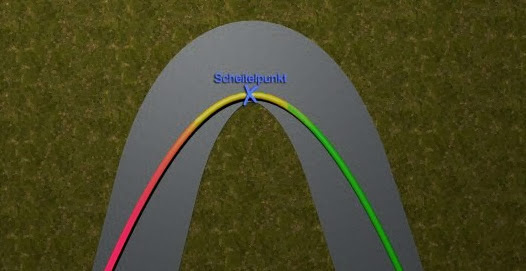 The roll-out you should put between the two parts of the curve, so that you can accelerate out of the second turn out. Now it is only on what fails harder of the two S-curve parts. In our example it is the second graphic. 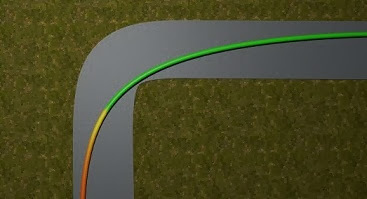 Is it the first section, only the order changes - then you should take the first curve similar as the previously described hard hairpin and as straight as possible pull out. If both parts of the S-curve to be very steep, help only a permanent throttling the speed. In this case, however, we speak rather of a chicane. Harassment, you should similar approach as soft hairpins, because since it depends on a constant speed, Constant braking and accelerating cost you more time.